On the way to an after-work holiday get-together and need to bring an appetizer? Looking for a quick game-day snack? 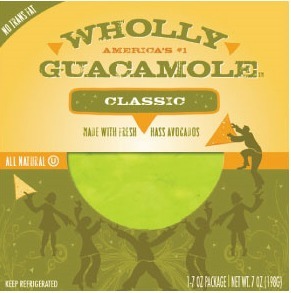 For a quick, fast, grab-on-the go, no-fuss, no-worry and yummy appetizer idea… reach for Wholly Guacamole! All natural, gluten-free, and made with 100% hand-scooped Haas avocados Wholly Guacamole is a perfect appetizer choice. Found in your grocer’s refrigerated section, Wholly Guacamole tastes like the guacamole I’d make myself if only I had the: 1.) Time and 2.) Several perfectly ripened avocados that never seem to be available when needed. I also love this stuff smothered on my gluten-free bread and topped with smoked turkey, and jalapeno cheddar. Yums. Convenience, good taste and never needing a ripe avocado again in my life are all the reasons why Wholly Guacamole is this week Friday Favorite on BeFreeForMe.com.